After over two decades of trying to persuade anyone who would listen that he lives a veritable monk-like, celibate existence, in which flighty, fluffy concepts such as love were ill-conceived notions of the common-man and sexual lust the mere constraints of those unable to intellectually conquer our more basic instincts, Morrissey finally has his Doris Day meets Hugh Hefner moment in this album, as he accepts love and lust into his life. It is a bizarre volte-face as the Pope of Mope turns into an inconceivable 'Love God' right before our ears. For the lad is well and truly in love...or as my Dad used to say every time my latest teenage love interest would cause me to become more attentive to my looks, pretend to shave just so I could steal a bit of his Old Spice and save my Saturday job money to engage in my sudden interest of all things 'fashionable'...'the lad has got it bad'. Morrissey is plainly infatuated and does not hold back in expressing it to such an extent that it is a bit 'oh so nice', or at least it would be if it was not so incredibly antagonistic to the general Morrissey essence, with tracks such as To Me You Are A Work of Art insisting he is found the person that 'can soothe me', whilst the superlative You Have Killed Me (see below) reaches out for the sort of flowery prose that gushes that he has found the person who has unlocked his heart 'with your key'. Despite all the 'flowers' that might usually act as a repellent in a Westlife manner, it remains totally compelling because, after all, it is Morrissey releasing the 'love slush' and as such has a sense of perversity about it. Lust, is the other temple of human emotion that Morrissey previously had not hinted at visiting since the 'leather ran smooth' in The Smiths 'This Charming Man' over 20 years before. However in this album there is none of the subtle wordplay he famous for. No hints, no suggestion, no inferences whatsoever. It is almost as if holds up his appendage, paints it a startling fluorescent neon green colour and screams 'look what I am using (a lot)'. The epic Dear God, Please Help Me (see below), which behind 'Every Day Is Like Sunday is surely the mans finest track, sees Morrissey removing the tulips that used to bedeck his back pocket on Top of The Pops, throw them down to the floor and skip through them with a new lust for life...or just a new lust, as he vigorously issues declamatory statements about explosive Kegs between his legs and graphically describing that now I'm spreading your legs. He has suddenly become the sexual aggressor, a man controller by his baser urges, rather than just the cool self appointed denizen assigned to issue social polemic. Again it is just so unlike the man that it just reeks of perversity. 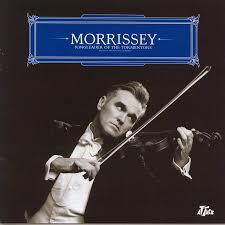 Of course Morrissey wanted to shock and ensured that the comparative dichotomy of this new album and his previous catalogue was accentuated maximally by getting Italian producer, Tony Visconti, to ensure he added his famed luscious string flourishes wherever possible and the sort of lush aesthetic that is more suited to sophisti-pop. 20 years after this release, Morrissey has long since gone back to his superbly miserable ways, as he snipes and derides just about anything that engenders public opinion. As such this album remains his one brilliantly 'truly different' album.